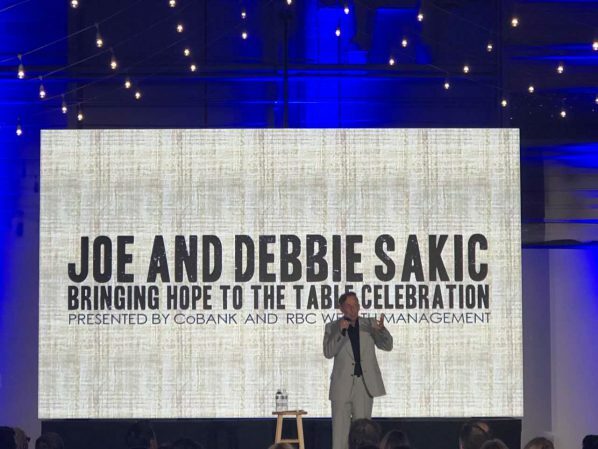 The Joe & Debbie Sakic Bringing Hope to the Table Celebration is one of Colorado’s most entertaining events. Held in August, this annual banquet, billed as an evening of “fun, food, and laughter,” raises money for the Food Bank of the Rockies’ children’s programs. The gala was held at The Hanger at Stanley, the former site of the original Denver airport’s main runway. The facility encompasses a total of 18,500 square feet of dynamic event space, which is what allowed the Image AV team to take a unique approach to providing the presentations and audio at the event. Our technical team of eight provided a wide array of AV technologies, from line-array sound to LED effect lighting to a High Definition LED videowall. Because of the venue’s existing windows and subsequent high levels of ambient sunlight, a large-venue video projector and projection screen would have resulted in reduced viewability. The 60 module, high-definition LED videowall provided by our team easily met the challenge of providing an extremely bright, large-scale video display to overcome the room’s challenges with an early evening event starting time.